It is easy and fun to build your own machine quilting frame! Our plans make it simple and affordable to get into machine quilting. The plans include pictures and descriptions in easy to follow steps for building a ten foot frame and a twelve foot frame and advice and tips on custom sizes. 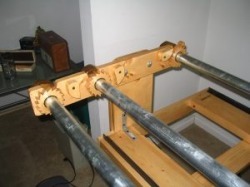 This twelve foot frame as pictured here (machine not included) was built with readily available materials from Lowes Home Improvement Center for well under $200 complete with carriage and handles. You will also get free tech support via e-mail or phone to get you through the building process. Not handy with power tools? No problem we also offer pre-cut parts and kits to simplify your building experience! These plans are not meant to teach people to use woodworking or other tools. Please be advised that when you decide to build a frame that you agree that I cannot be held liable for any injuries sustained while making and using this frame.